A Puppy for Christmas? Stop Before You Shop or Adopt! Thinking about giving a pet as a holiday gift? Last year we shared info about a great public awareness campaign from Dogs Trust Ireland called “A dog is for life, not just for Christmas.” Now is the perfect time to remind well-meaning gift givers to think twice before giving an animal as a present for the holidays. 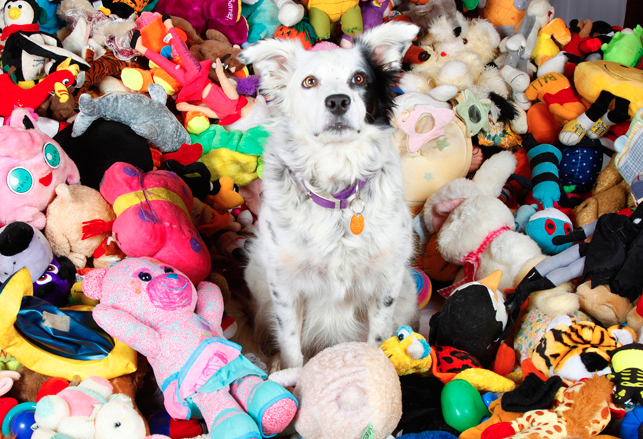 Viewers of this week’s 60 Minutes were treated to a profile of an amazing border collie named Chaser and her owner John Pilley, a retired professor of psychology who has taught her the names of over 1,000 toys. Every toy has a unique name, and Chaser can identify each one when asked. Depending on the command, Chaser will bring the toy to John, or put her nose or paw on the toy. Pilley says she has a vocabulary and cognitive abilities on par with a two year old human toddler. Recent studies of canine intelligence show that dogs are capable of inferential reasoning, illustrated by the example of showing a dog two cups, hiding a toy under one of them, pointing to the cup with the toy, and the dog understanding that the toy will be where you point. Not all animals have this ability. You knew your dog was smart, but what about a dog’s emotions and feelings? In other research, scans of dogs’ brains show that the “reward center” of the brain is stimulated by the unique scent of a dog’s owner. This is the same part of the brain that is stimulated in humans by such things as a favorite song, or thinking about someone you care about. Ever notice that look of love in your dog’s eyes? Studies show that when humans and dogs make eye contact, a dog’s brain releases oxytocin, the same hormone that helps mothers bond with their new babies. This proves that your dog gets the same warm feeling as you when spending time together. Want to learn more about your dog’s intelligence? Check out the website Dognition, mentioned on the show. Watch the full 60 Minutes episode about Chaser HERE. Thank You Carlsbad Golf Center! 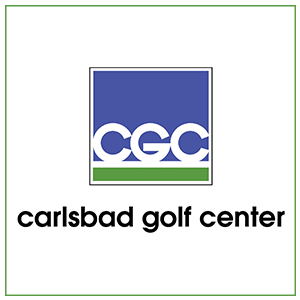 FACE would like to thank Carlsbad Golf Center for being a generous sponsor of our 3rd Invitational Dog-Friendly Golf Tournament on November 3rd. Carlsbad Golf Center was voted San Diego’s Best Golf Shop in the 2014 U-T San Diego Readers Poll, and we couldn’t be more excited about their support. Meet Toly! This handsome Russian Blue kitty had a spout of bad luck earlier this month when he had two urethral obstructions in a row. After spending as much as they could on treating Toly’s first obstruction, his owners, a young couple living paycheck to paycheck, couldn’t afford the emergency surgery that was needed to help save Toly. Thankfully, Bonita Pet Care Veterinary Hospital referred them to FACE who was able to assist with Toly’s life saving surgery. 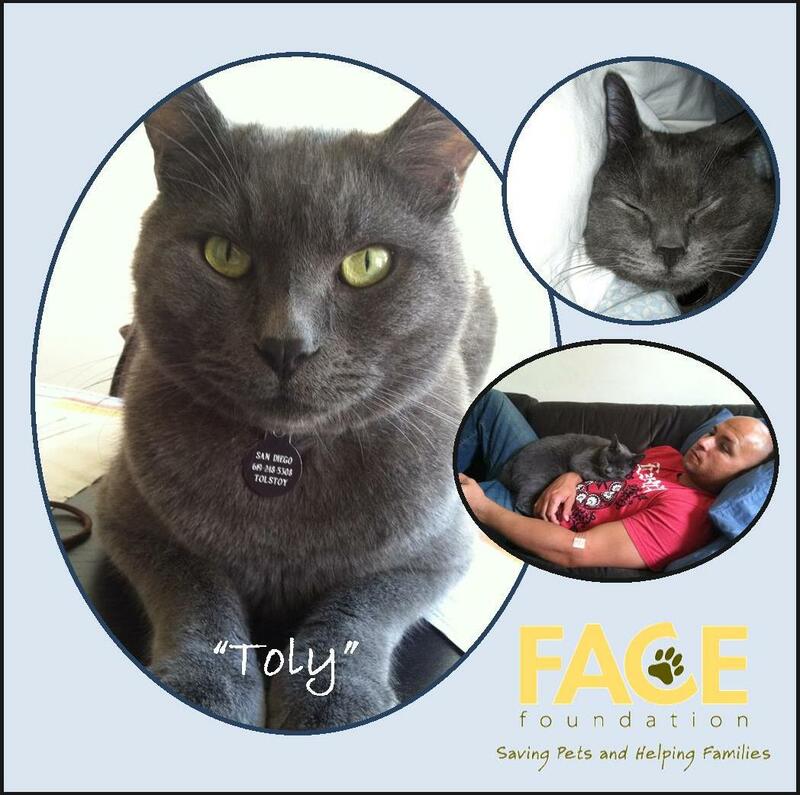 Special thanks to Narrow Gate Foundation for helping to save Toly. Meet Juna! Juna was found in a park by her owners about a year ago when she was a kitten. She seemed frightened and was so tiny that they wanted to try to help by giving her a home. Last month, Juna became very sick over a period of a few days and her owners knew something must be wrong. They took her to the vet where she was diagnosed with pyometra, a very serious infection that if left untreated can be fatal. Juna needed an emergency surgery quickly to save her life. Her owners, a single working mother and her daughter, were heartbroken when they found out that this surgery was not something they could fully afford. The great team at Care and Comfort Veterinary Hospital wanted to help this family, so they referred them to FACE. With the help of this hospital, FACE was able to fund for Juna’s emergency surgery. 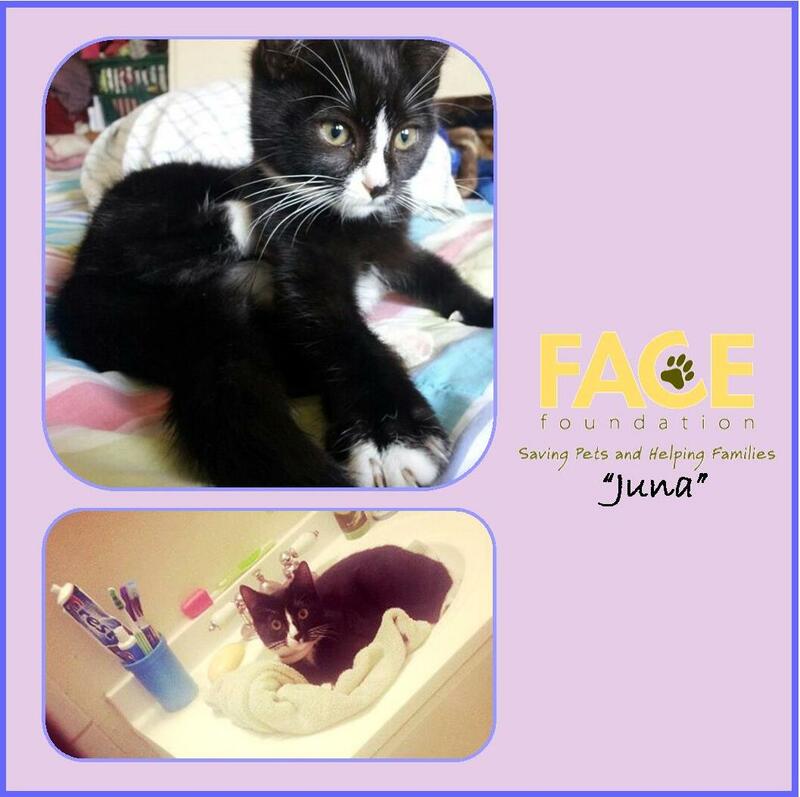 Special thanks to FACE Life Sponsor Care and Comfort Veterinary Hospital for helping to save Juna.